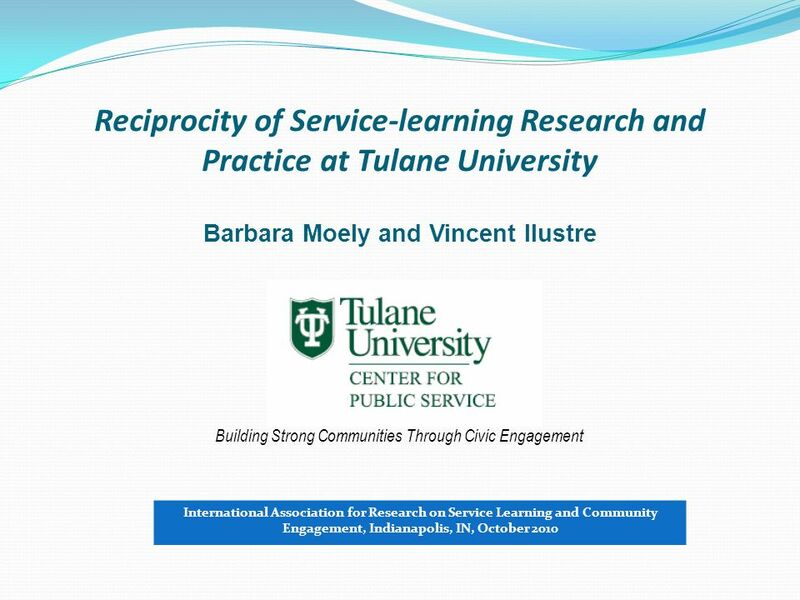 Reciprocity of Service-learning Research and Practice at Tulane University Building Strong Communities Through Civic Engagement Barbara Moely and Vincent. 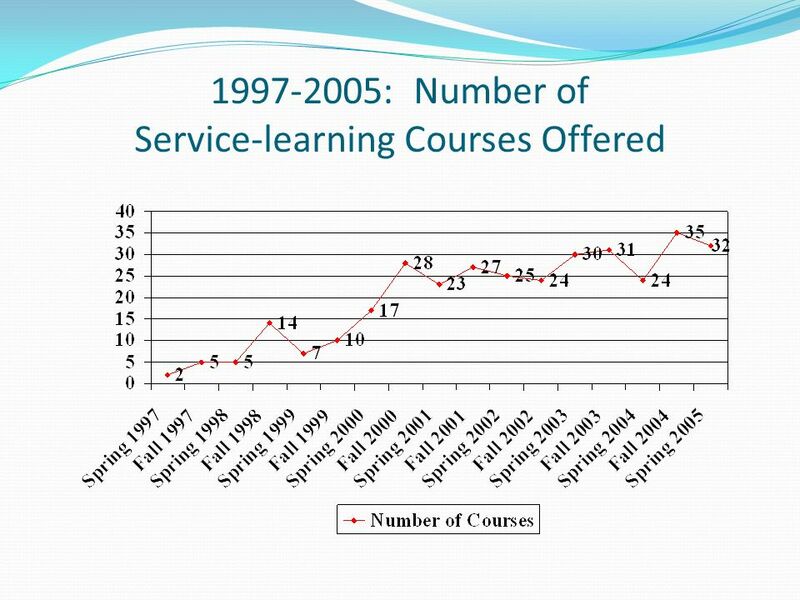 8 Initial Research (1999-2000): What are students gaining from their service-learning experiences? 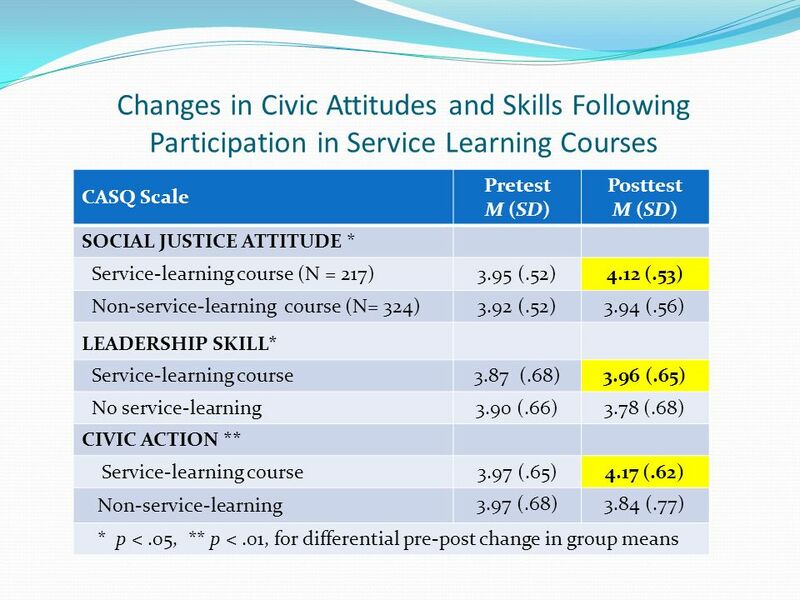 Development and use of the Civic Attitudes and Skills Questionnaire (CASQ) Moely, Mercer, Ilustre, et al. 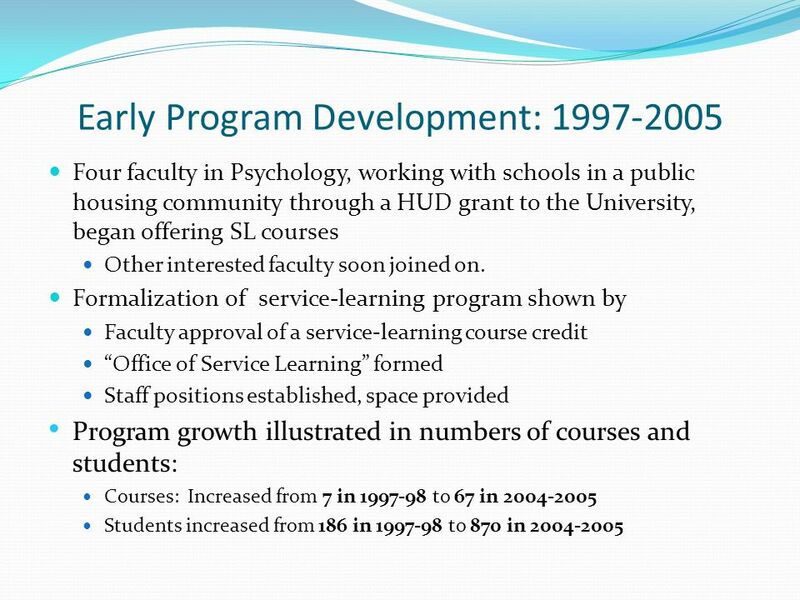 (2002) Moely, McFarland, et al. 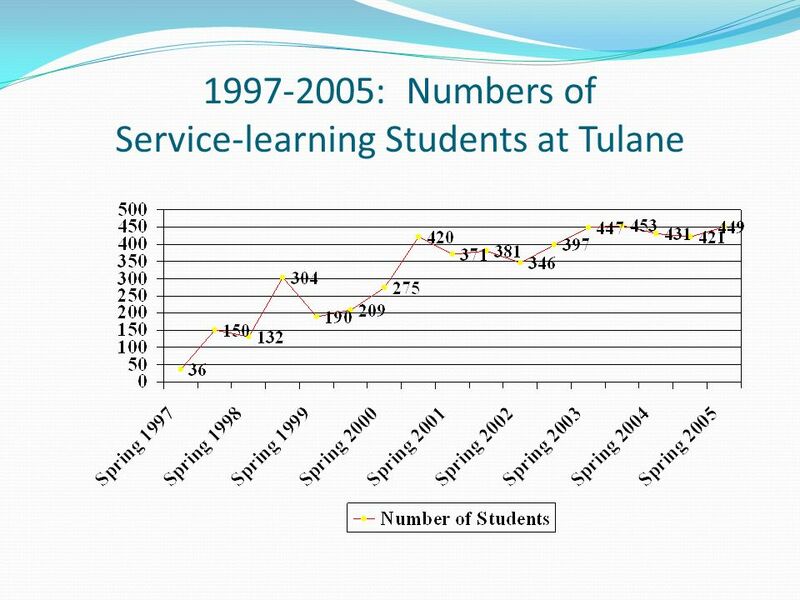 (2002) Tulane students engaged in service learning showed pre- post course increases in ratings of their own civic attitudes and skills, greater than those shown by students in comparison courses that did not involve service learning. 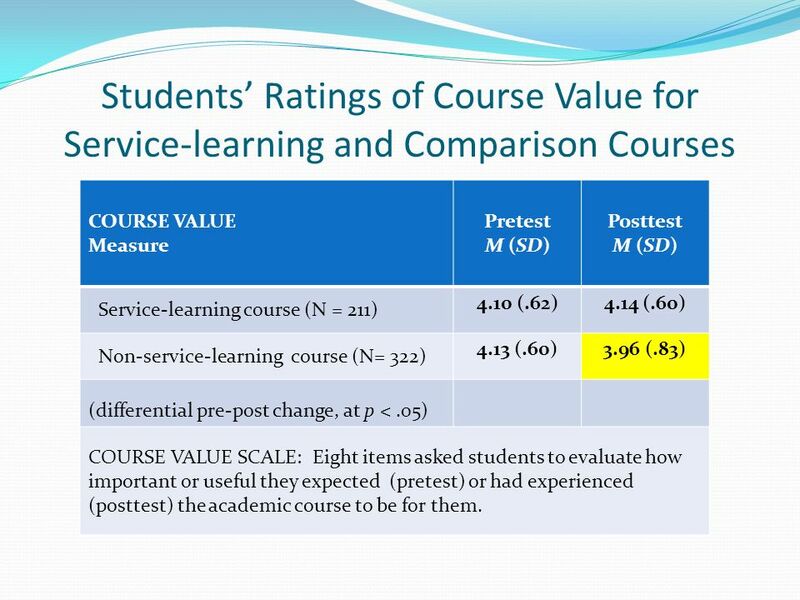 10 Students Ratings of Course Value for Service-learning and Comparison Courses COURSE VALUE Measure Pretest M (SD) Posttest M (SD) Service-learning course (N = 211) 4.10 (.62)4.14 (.60) Non-service-learning course (N= 322) 4.13 (.60)3.96 (.83) (differential pre-post change, at p <.05) COURSE VALUE SCALE: Eight items asked students to evaluate how important or useful they expected (pretest) or had experienced (posttest) the academic course to be for them. 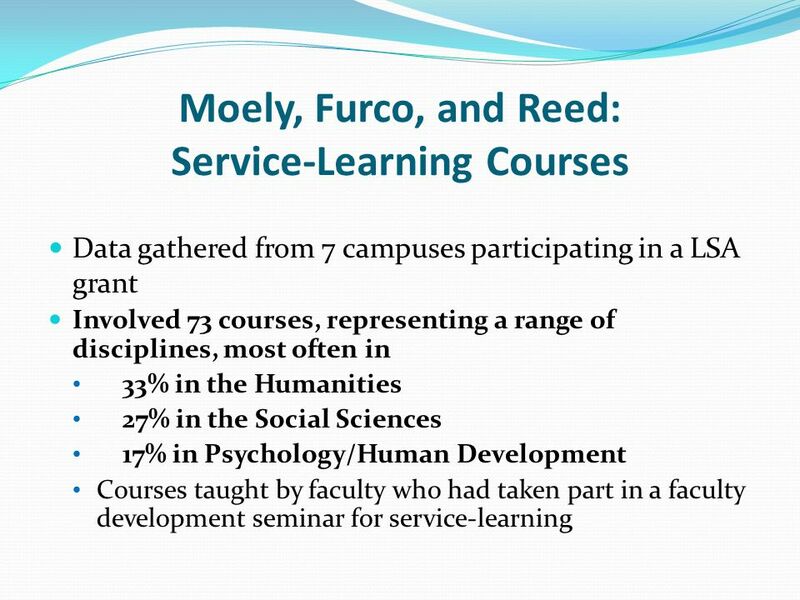 12 2001-2 Research: Does service-learning contribute to University goals? 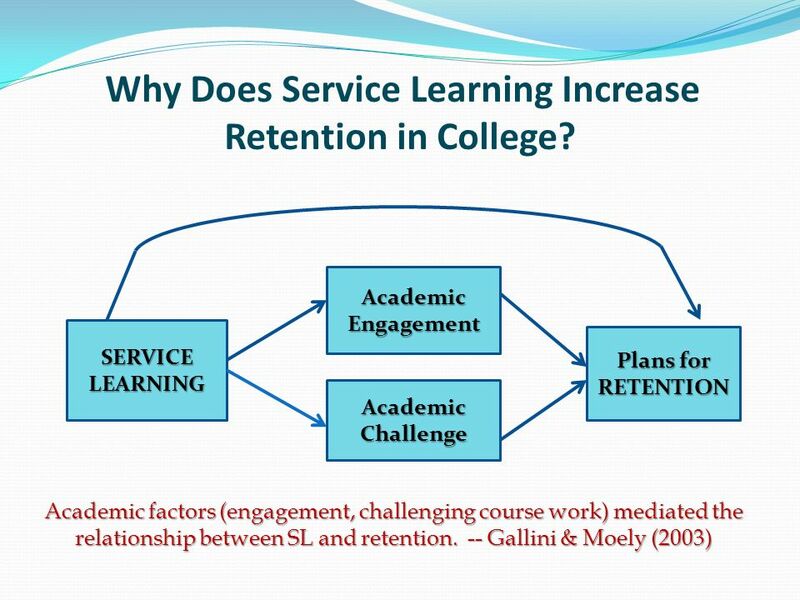 Study of service-learning and students plans for continued study to university graduation (retention): Sarah Gallini: Surveyed 333 Tulane students in SL and other comparable courses Students in service-learning courses evaluated their courses more positively than did students in non- service-learning courses: Higher academic, community, and interpersonal engagement, more challenged by their courses SL course increased their plans to continue study. 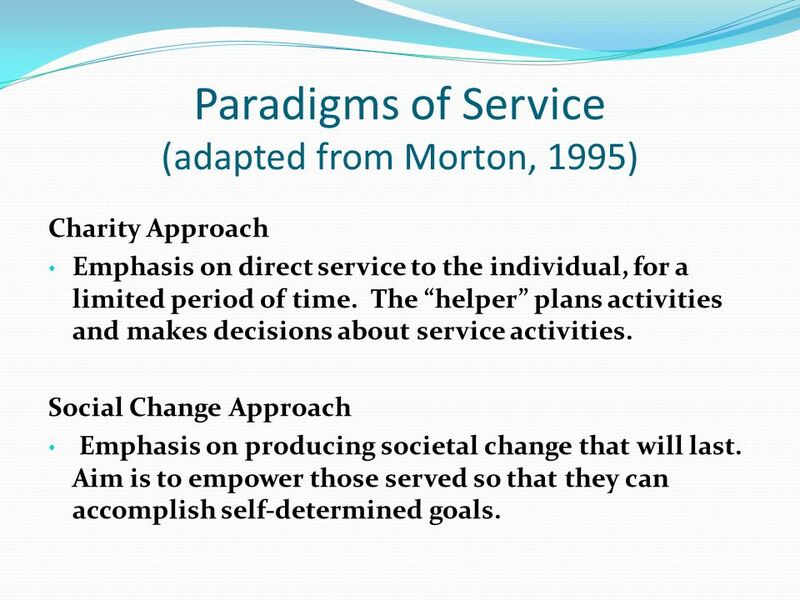 16 Paradigms of Service (adapted from Morton, 1995) Charity Approach Emphasis on direct service to the individual, for a limited period of time. The helper plans activities and makes decisions about service activities. Social Change Approach Emphasis on producing societal change that will last. Aim is to empower those served so that they can accomplish self-determined goals. 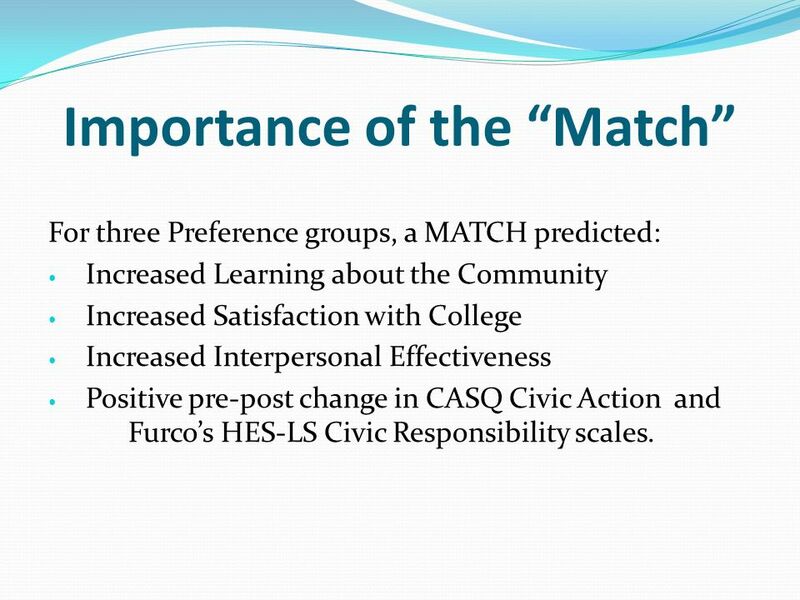 22 Importance of the Match For three Preference groups, a MATCH predicted: Increased Learning about the Community Increased Satisfaction with College Increased Interpersonal Effectiveness Positive pre-post change in CASQ Civic Action and Furcos HES-LS Civic Responsibility scales. 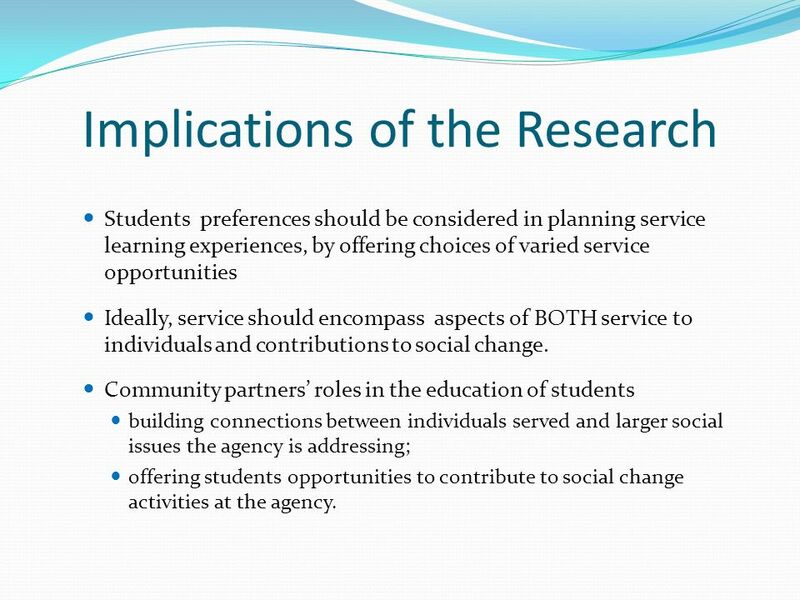 24 Implications of the Research Students preferences should be considered in planning service learning experiences, by offering choices of varied service opportunities Ideally, service should encompass aspects of BOTH service to individuals and contributions to social change. 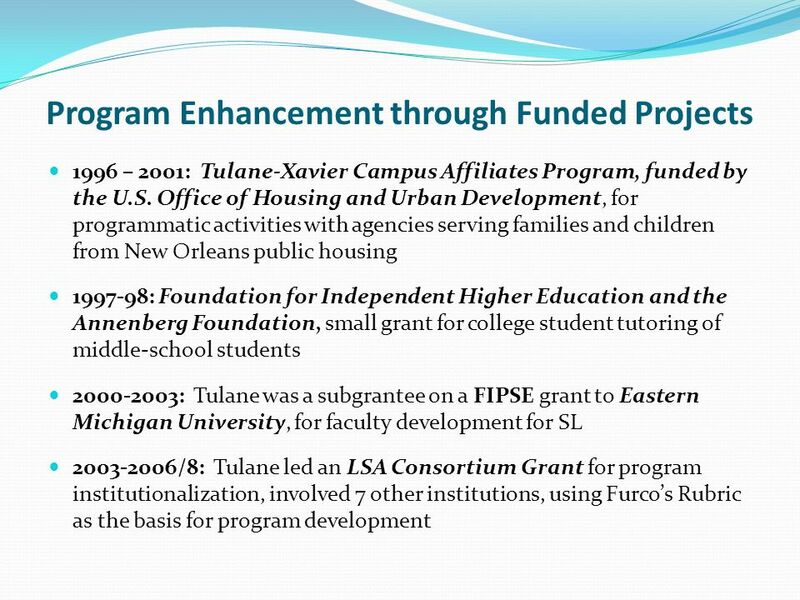 Community partners roles in the education of students building connections between individuals served and larger social issues the agency is addressing; offering students opportunities to contribute to social change activities at the agency. 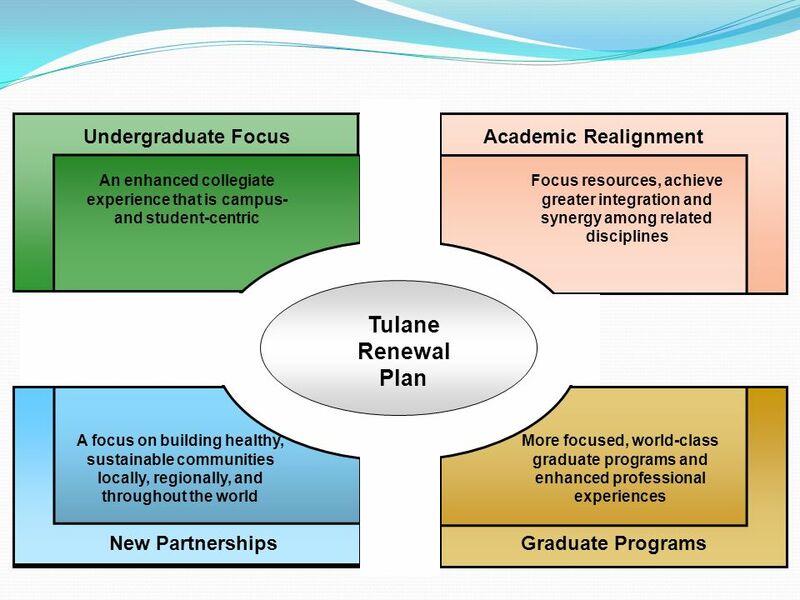 32 Research Design Year of Tulane Entry: Time of Test (Year) 2006200720082009201020112012 2003- 05 257* 20062904755 200718555X 2008195148X * Numbers indicate number of students completing surveys; color codes indicate Year in College (e.g. 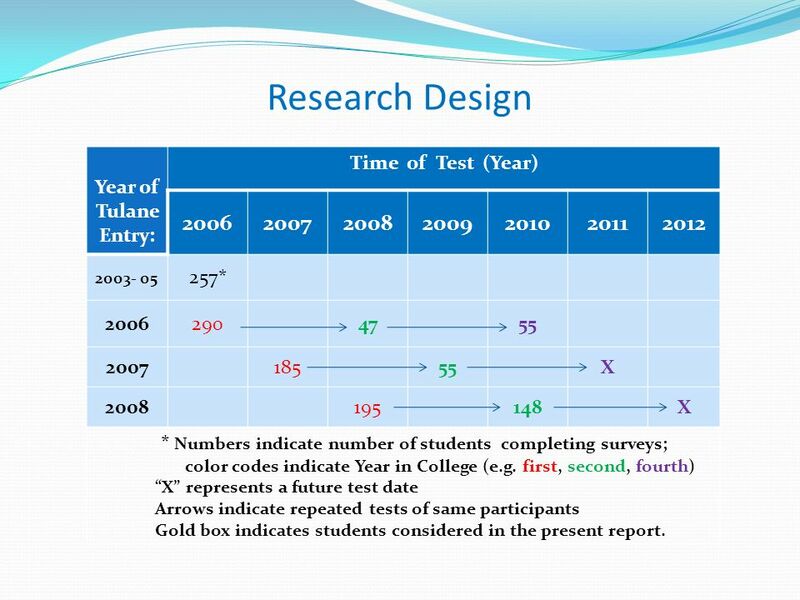 first, second, fourth) X represents a future test date Arrows indicate repeated tests of same participants Gold box indicates students considered in the present report. 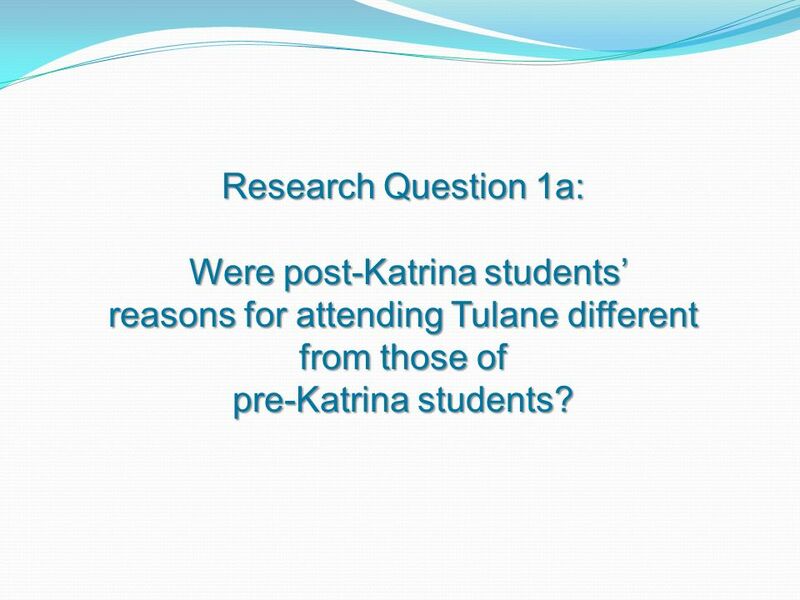 33 Research Question 1a: Were post-Katrina students Were post-Katrina students reasons for attending Tulane different from those of pre-Katrina students? 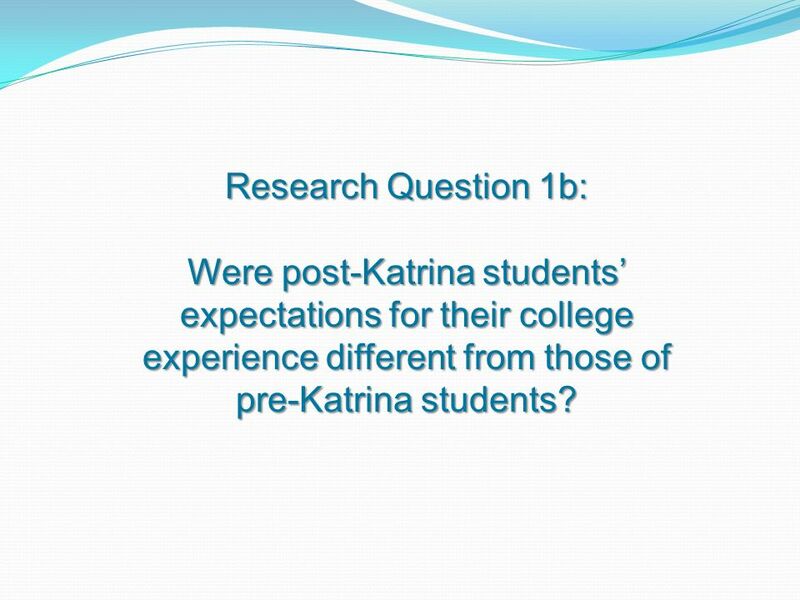 35 Research Question 1b: Were post-Katrina students expectations for their college experience different from those of pre-Katrina students? 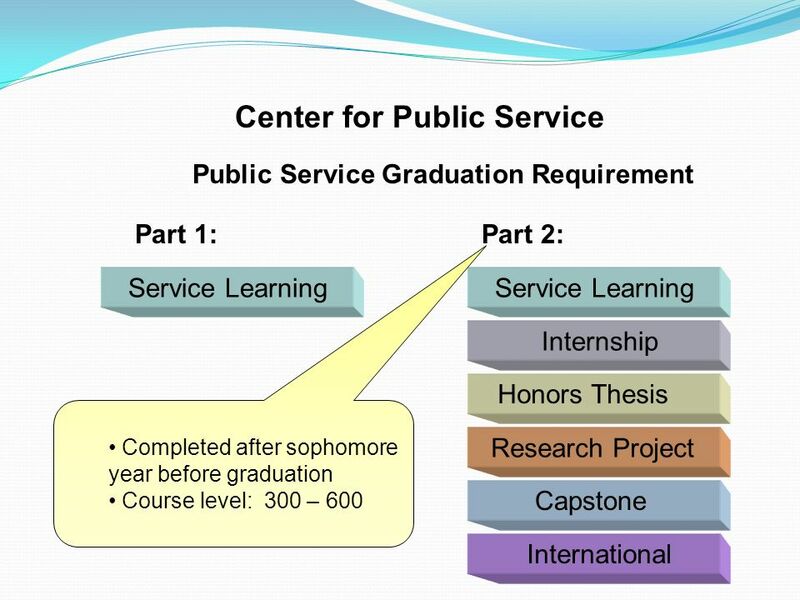 37 Research Question 2: How did incoming students view the public service graduation requirement? 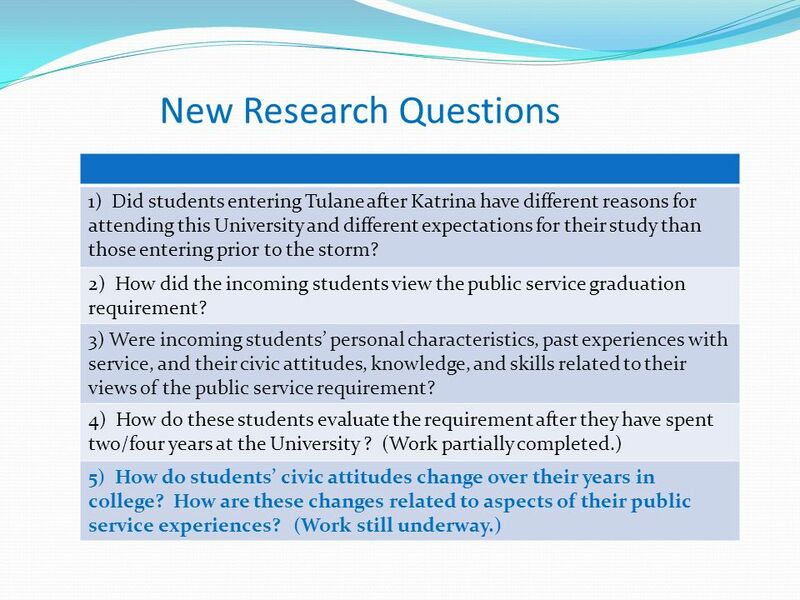 39 Research Question 3: Were incoming students personal characteristics, prior experiences with service, and their civic attitudes, knowledge, and skills related to their views of the public service requirement? 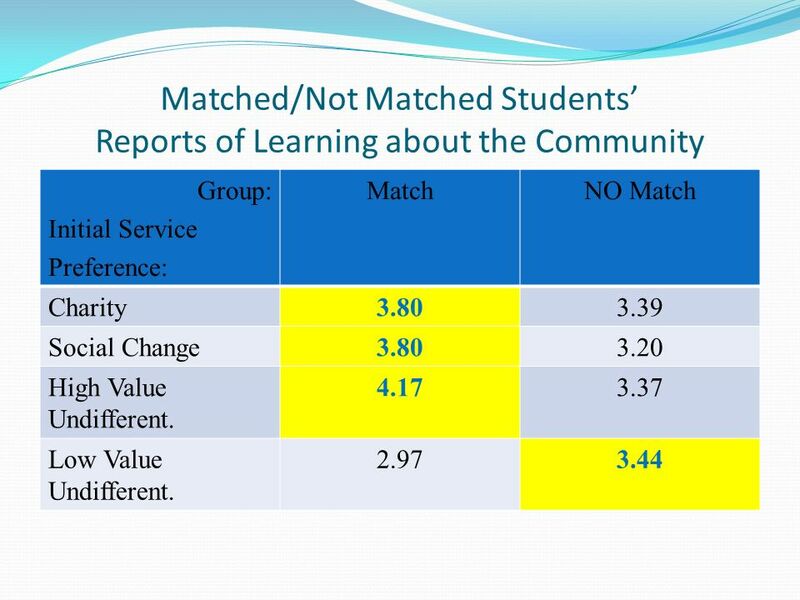 44 Understanding Students Views of the Requirement In contrast to these findings of a consistent and lasting positive view of the requirement, studies of K-12 service learning have shown that students show negative reactions to a required service-learning experience. What might explain the difference? 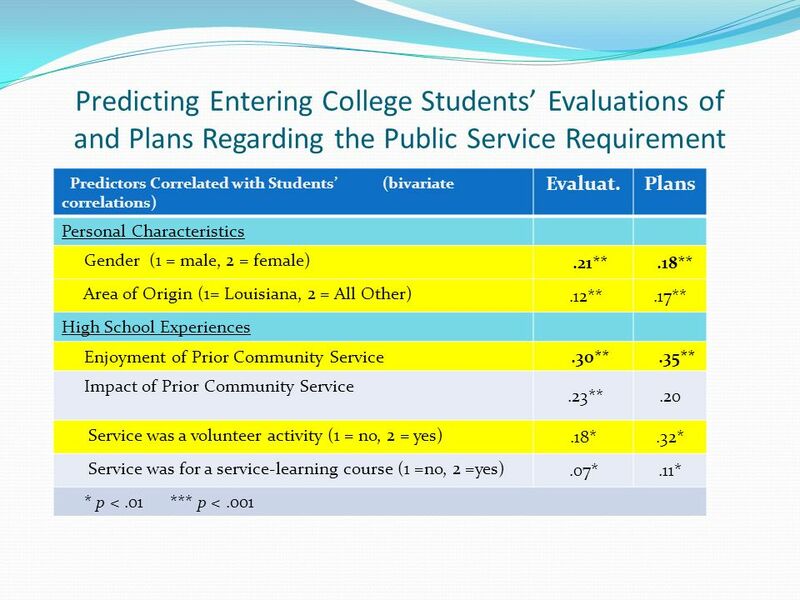 Stukas, Snyder, & Clary (1999) found that negative reactions to required service are less likely among college students who 1 ) have a strong history of service activities, and 2) do not perceive the requirement as a strong form of control. 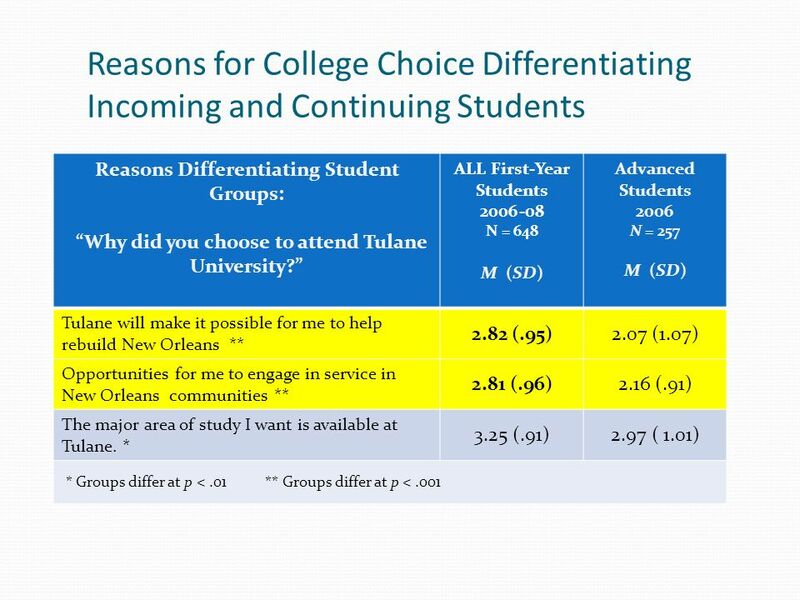 Our study: 1) Past experience did predict positive reactions; 2) Control was less apparent because students came to the university with interest in service, and they had choices of ways in which to complete the requirement. 47 Summary of Current Research Incoming students positive views of requirement are influenced by Gender, Area of Origin Positive prior community service experience Civic attitudes and Interpersonal Skills Students views of the public service requirement continue to be positive after two years of academic study. 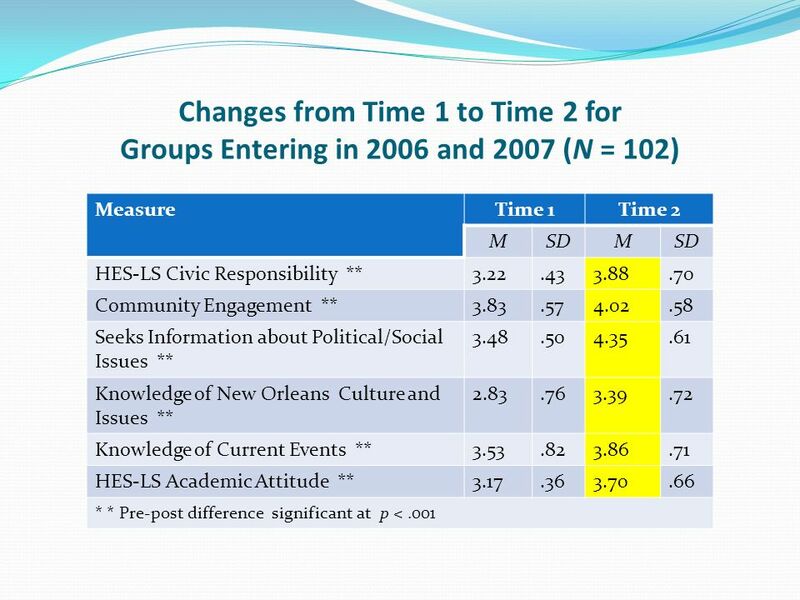 They see public service as a good or OK idea They report doing more than the amount required Students show increases in positive civic attitudes after two years. 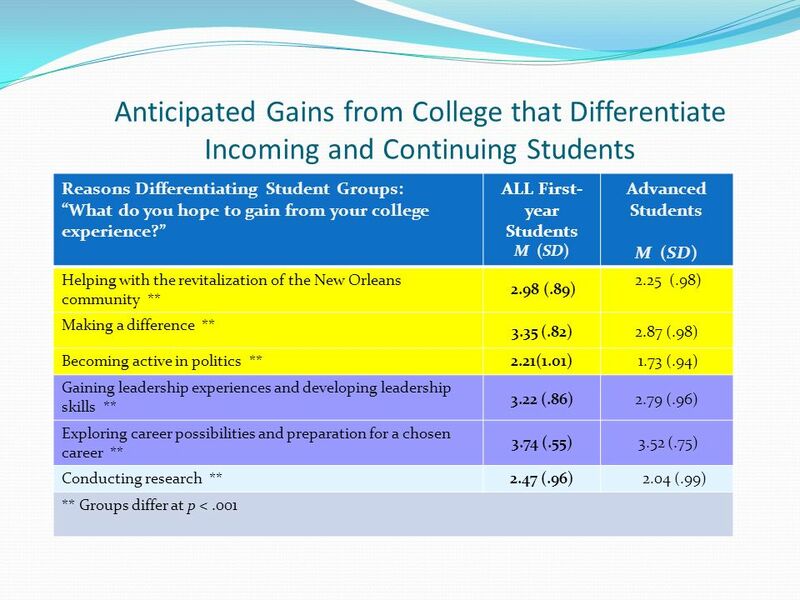 48 Implications of Current Research Concerns about students possible negative reactions to the requirement are not confirmed by the findings. Student choice in completing the requirement may contribute to the positive outcomes, so that offering an array of service-learning courses and other kinds of public service experiences is important. Question for the field: Can these findings be generalized to other institutions and contexts, or is this something specific to a particular campus and city at a unique time? 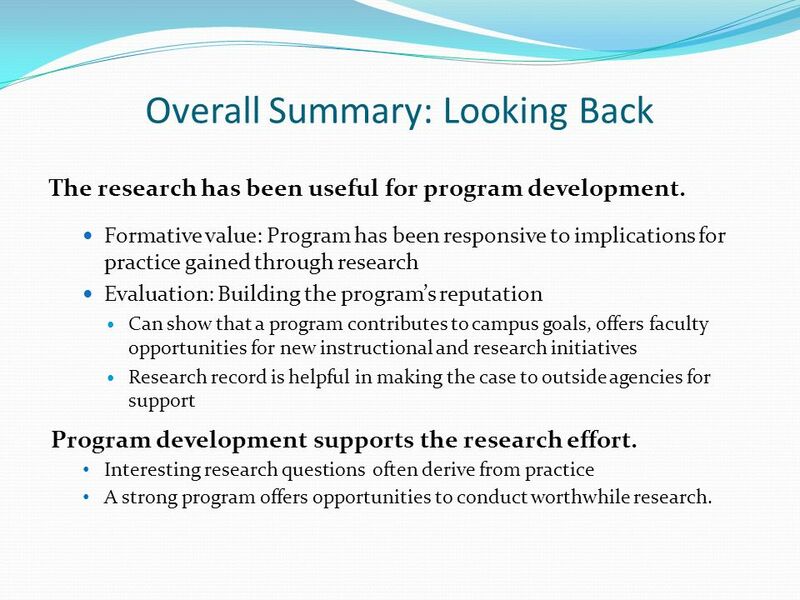 49 Overall Summary: Looking Back The research has been useful for program development. 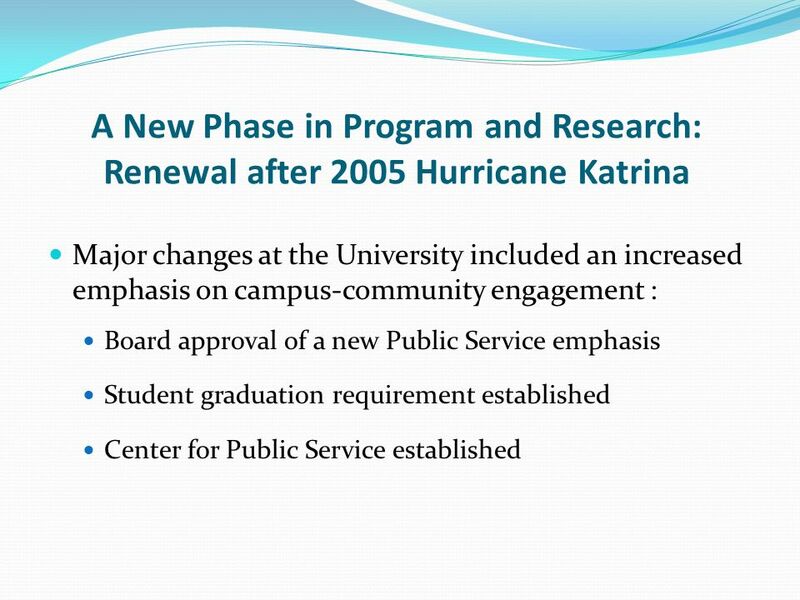 Formative value: Program has been responsive to implications for practice gained through research Evaluation: Building the programs reputation Can show that a program contributes to campus goals, offers faculty opportunities for new instructional and research initiatives Research record is helpful in making the case to outside agencies for support Program development supports the research effort. 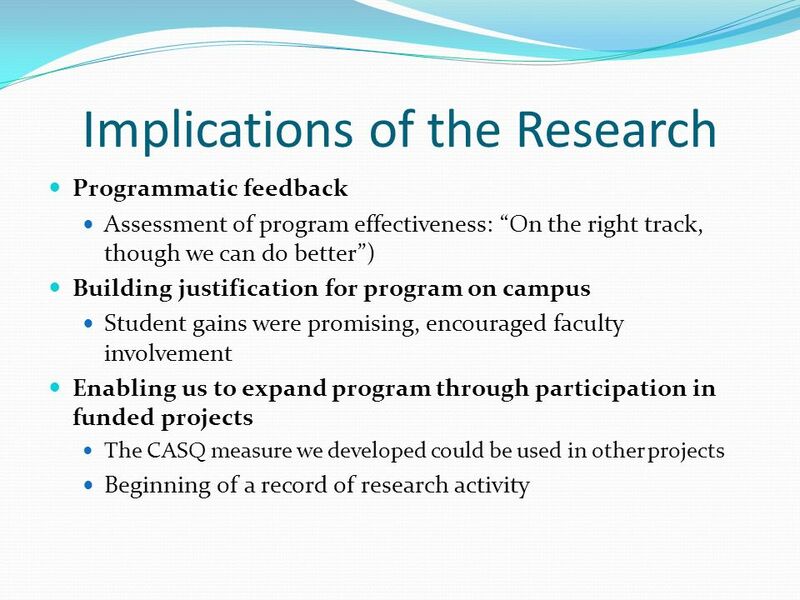 Interesting research questions often derive from practice A strong program offers opportunities to conduct worthwhile research. 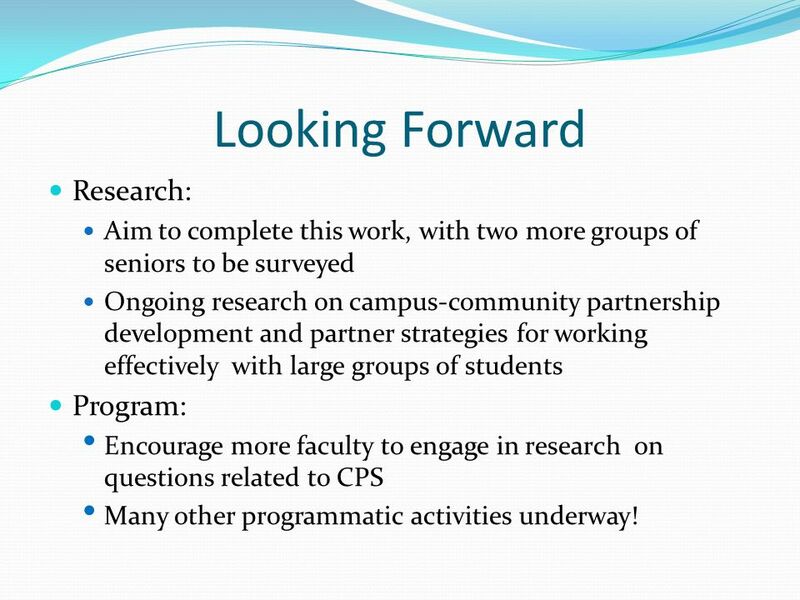 50 Looking Forward Research: Aim to complete this work, with two more groups of seniors to be surveyed Ongoing research on campus-community partnership development and partner strategies for working effectively with large groups of students Program: Encourage more faculty to engage in research on questions related to CPS Many other programmatic activities underway! 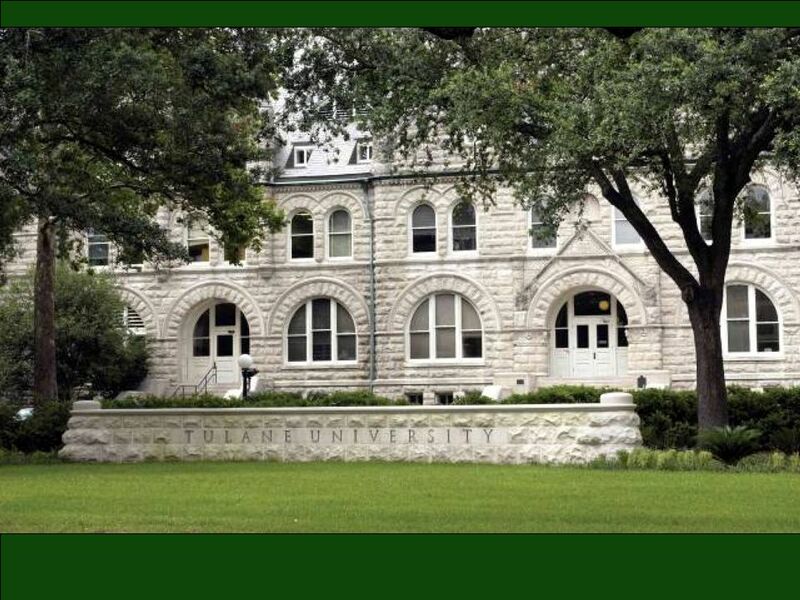 51 References for Tulane work Moely, B. E., Mercer, S. H., Ilustre, V., Miron, D., and McFarland, M. (2002). Psychometric properties and correlates of the Civic Attitudes and Skills Questionnaire (CASQ): A measure of students attitudes related to service learning. Michigan Journal of Community Service Learning, 8, 15-26. Moely, B. E., McFarland, M., Miron, D., Mercer, S. H., & Ilustre, V. (2002). 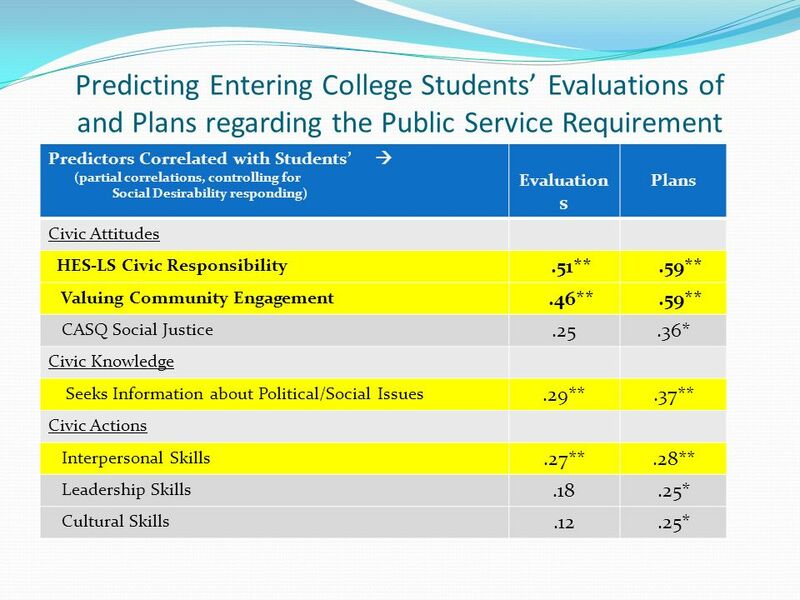 Changes in college students attitudes and intentions for civic involvement as a function of service-learning experiences. Michigan Journal of Community Service Learning, 9, 18-26. 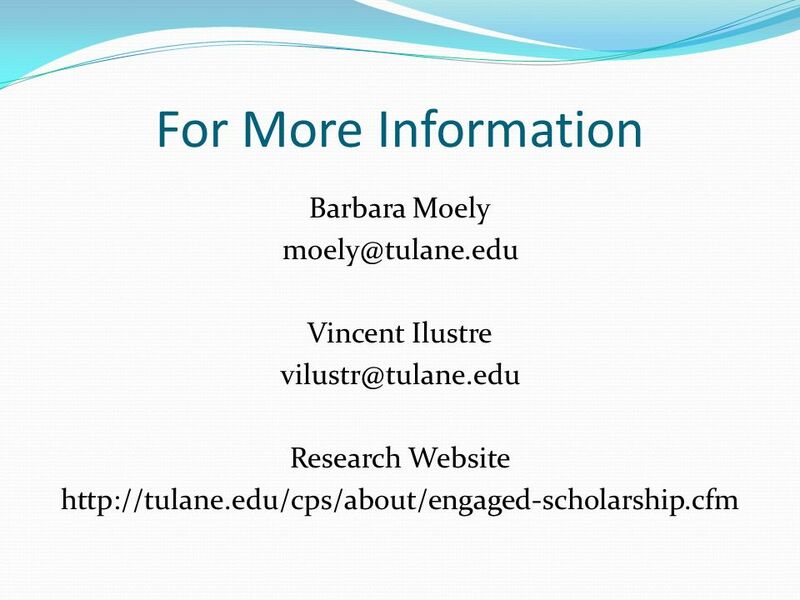 Gallini, S., & Moely, B. E. (2003). 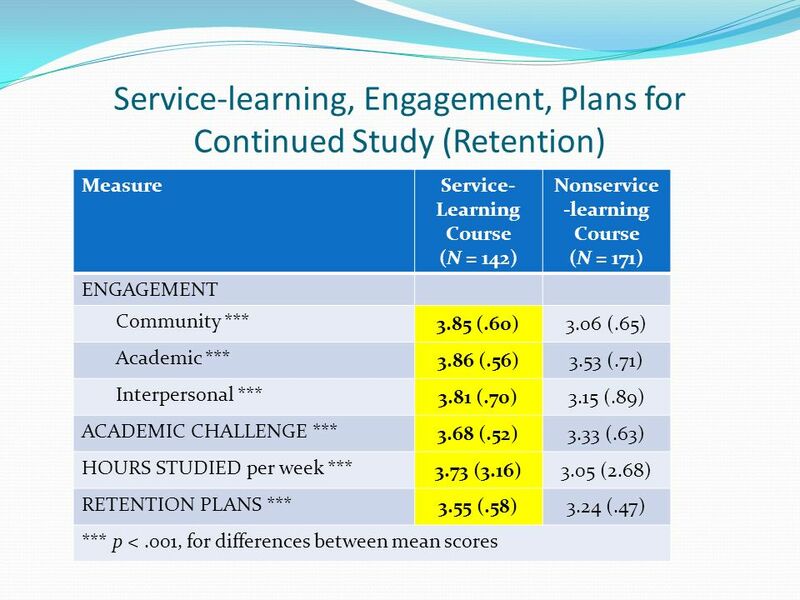 Service learning and engagement, academic challenge, and retention. Michigan Journal of Community Service Learning, 10, 5-14. Moely, B. E., & Miron, D. (2005). 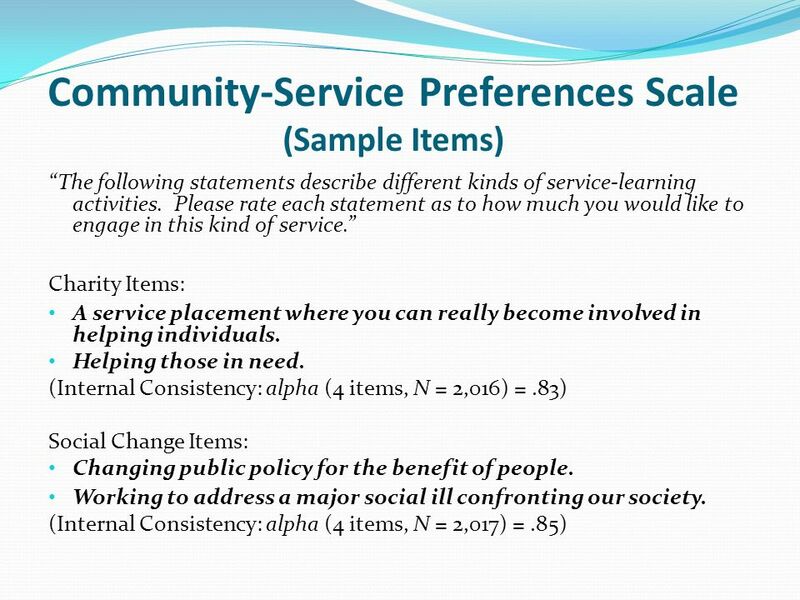 College students preferred approaches to community service: Charity and social change paradigms. In S. Root, J. Callahan, and S. H. Billig (Eds.) 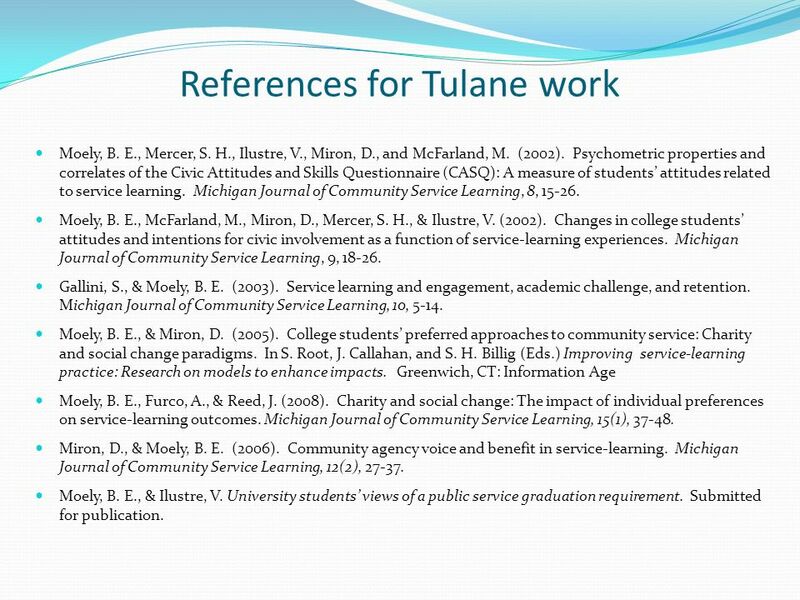 Improving service-learning practice: Research on models to enhance impacts. Greenwich, CT: Information Age Moely, B. E., Furco, A., & Reed, J. (2008). 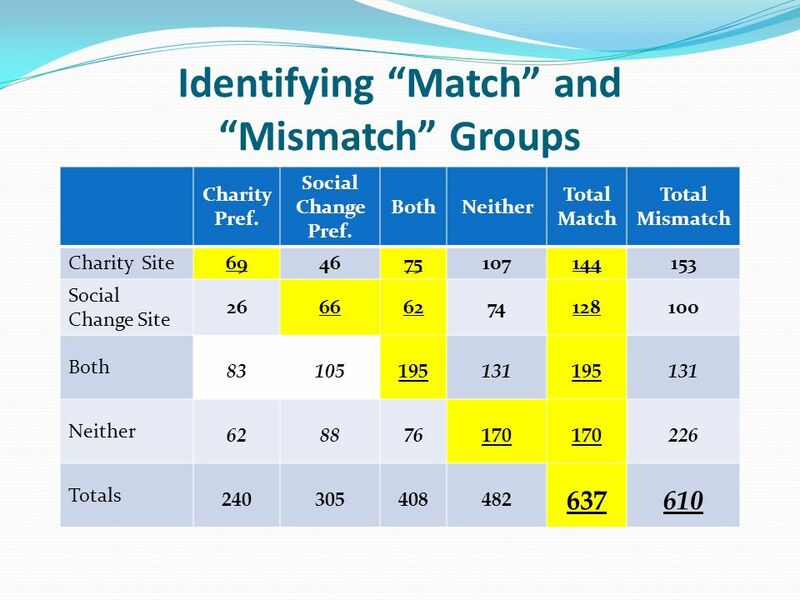 Charity and social change: The impact of individual preferences on service-learning outcomes. Michigan Journal of Community Service Learning, 15(1), 37-48. Miron, D., & Moely, B. E. (2006). Community agency voice and benefit in service-learning. Michigan Journal of Community Service Learning, 12(2), 27-37. 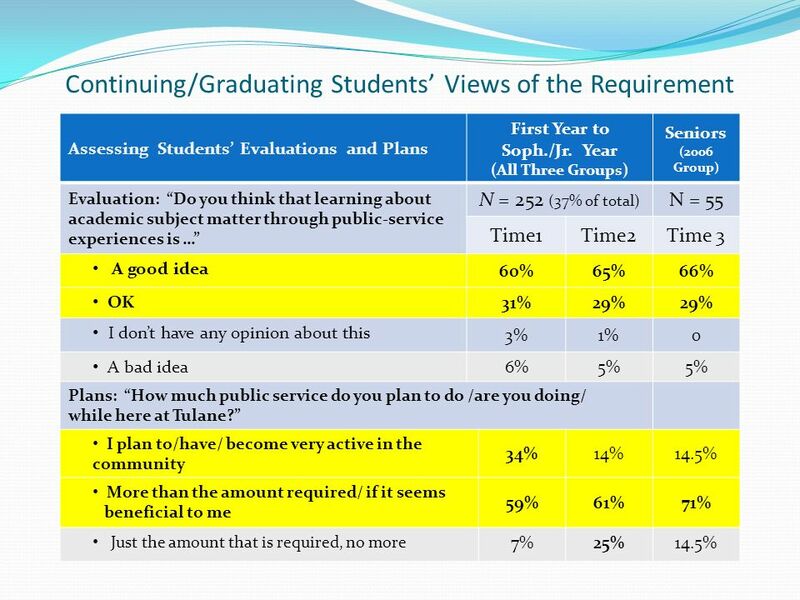 Moely, B. E., & Ilustre, V. University students views of a public service graduation requirement. Submitted for publication. 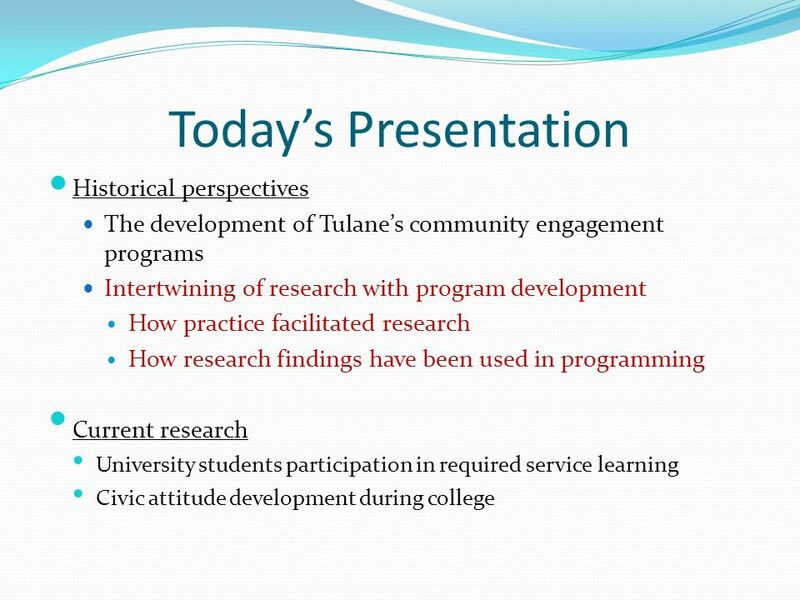 Download ppt "Reciprocity of Service-learning Research and Practice at Tulane University Building Strong Communities Through Civic Engagement Barbara Moely and Vincent." What do you think EL Civics is? Sustaining Ohios Waiver Reforms: Possibilities & Challenges 12 th Annual CW Demonstration Projects Meeting, June 2008 Human Services Research Institute. July 11, 2006 Council of Graduate Schools 1 Ph.D. Completion Project: Using the Baseline Data 2006 CGS Summer Workshop Technical Workshop. Conformity Assessment Practices of the Trinidad and Tobago Bureau of Standards (TTBS) Mr Terrence Awai Head, Certification Division TTBS. EEurope or The Uptake of Information Technology Istanbul, 9 November 2000 Horst Forster European Commission. 2011 WINNISQUAM COMMUNITY SURVEY YOUTH RISK BEHAVIOR GRADES 9-12 STUDENTS=1021.